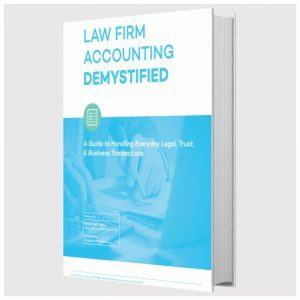 Written by Rick Kabra, CEO of CosmoLex, and Pamela Rozsa, president of the consulting firm PWR Resources, the book is geared towards both legal and accounting professionals who manage law firm finances. I was given an advance copy of the book and found it to be an informative introduction to key concepts of law firm accounting. Although the book uses the CosmoLex platform to show examples of accounting and billing functions, the descriptions of the concepts and functions are generic and therefore useful no matter what systems your firm uses. Basic accounting terms and concepts. The components of an accounting system. Along with the release of the book comes the launch of the legalaccountingguide.com website. The goal for the site, Kabra told me, is to make it a key resource for legal accounting materials and eventually to enable lawyers to engage with expert help. “We hope to build a large community here and offering the online edition of the book at no charge was the 1st step in the direction,” he said.